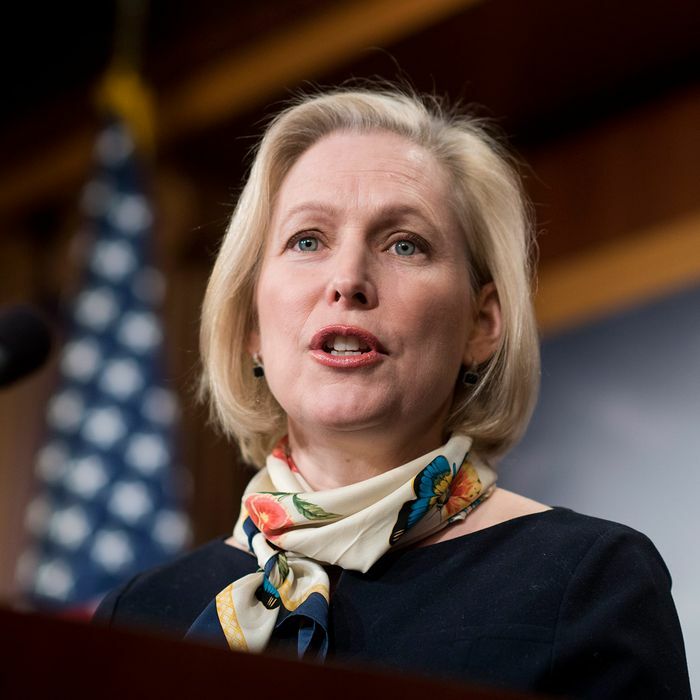 Earlier this year, Senator Kirsten Gillibrand reintroduced her pet bill: the Family and Medical Insurance Leave (FAMILY) Act, which would guarantee workers up to 12 weeks paid leave at at least two-thirds pay. And on Tuesday, at the Center for American Progress’s Ideas Conference, she detailed the pieces of that bill — and put forward a proposal to get it passed. A real paid-leave plan, she said, is “not just about maternity leave” or “just about babies,” but is “gender-neutral — it has to cover husbands who want to care for their wives when they’re sick, [or] sons who want to care for a dying parent.” She added that the plan (which conveniently sounds a lot like her bill) should be affordable for businesses — even small ones — and should be a “universal earned benefit” for American workers, meaning everyone participates. All of which was a nice refresher. But then, she suggested that if Americans want to pass such a bill, they should build on the momentum of movements like the Women’s March on Washington. Despite appearing alongside other 2020 hopefuls on Tuesday, Gillibrand has ruled out the possibility of making a presidential run in four years. Instead, she hopes to be reelected as a senator for New York, where she’ll likely keep pushing for a paid-leave policy that’s far removed from Ivanka Trump’s. Kirsten Gillibrand Is Becoming a Progressive Champion. Is a 2020 Run Next?